I set up a Deployment server. I am able to "Browser remote host" and see the remote files. 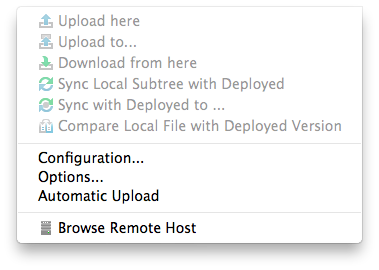 However, the other options for Upload, Download, and Sync are grayed out. How can I enable these? This is using IntelliJ IU-129.1359 with Python plugin 2.10.2. The issue was resolved via support. Missing path mapping configuration was the case.